The UK's most popular 25ml room odourisers 100% pure. Three 25ml bottles of ENGLISH for £15. A tray of 20 bottles for £75. Much better value.. and due to increased quantity the liquid doesnt appear to evaporate as quick..Great Product! Fairly strong and nice bigger bottle. Good service again for this repeat order. Fine. Correct goods at sensible price delivered promptly. You get loads but its a bit weak. Great product at an even better price. Very good value and they certainly work! Order our room odourisers online now or call us on 0783 448 1271 for immediate dispatch (if before 3pm) by first class post. 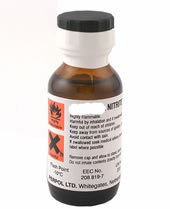 Liquid Gold room odourisers contain 98% isopropyl nitrite.